Generating hypotheses based on current conditions in the fresh produce market, and then analyzing and verifying them: this is the job of Farmind’s field merchandisers (FMDs), as the members of our hypothesis verification unit are known. 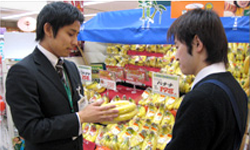 They serve as a bridge connecting producers with stores and consumers by engaging in a range of proposal activities, centered on a cycle of hypothesis generation and verification based on information obtained through store research and sales floor setup support (a Farmind offering), that contribute to enhancing sales floor and sales promotion proposals. In addition to competitor surveys and market research, our FMDs also conduct store surveys. This involves both gathering direct feedback from consumers and identifying and analyzing various problems related to products and sales promotion programs through interviews with personnel responsible for sales floor management. This input is combined with the results of quality inspections and POS data verification to generate proposals for specific solutions to the problems. When the client is a volume retailer, for example, designing sales floor layouts and communication with the store personnel responsible for sales floor management are crucial factors in Farmind’s business. These are also part of the FMDs’ job. During regular visits, the FMDs help to arrange the sales floor to enhance the products’ point-of-purchase visibility by such means as installing POPs and other SP tools with careful attention to product display considerations. They also collect information concerning sales and product quality from the personnel responsible for sales floor management as well as making proposals to promote the introduction of new products. Farmind reviews and proposes new sales techniques and product planning approaches based on a variety of survey results and information gathered on site during regular store visits. The FMDs contribute hypothesis generation and verification on the sales floor itself to determine their effectiveness and feasibility. In the case of stores where the customers’ age demographics vary with the time of day, for example, purchasing will naturally differ in accordance with these age demographics. We develop a sales plan based on this hypothesis and analyze and verify it on the actual sales floor. Besides these activities, we support formulation of optimal sales promotion plans, including event planning and design of a variety of sales promotion tools.